After some series of initiatives, carried out by a group of local experts on several areas, in 1882 the Manresa City Council rooms held an archaeological and artistic exhibition. Thus, on 1896 the mayor of Manresa inaugurated the "Museo arqueológico, biblioteca pública y exposición artístico industrial permanente" as a part of the Manresa City Council rooms. That Museum represented the origin of the current Museum. 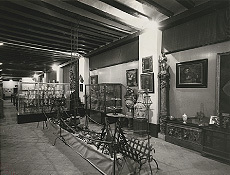 Picture of the museum, when it was located at the Manresa City Council building. Beginning of the 20th century. 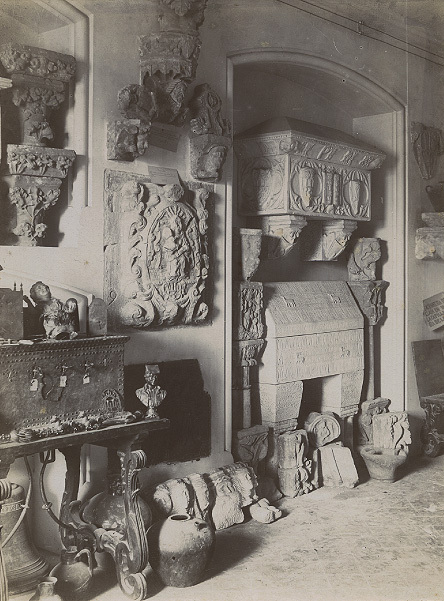 During its first years, the museum batches kept on growing, due to public works made in Manresa streets, to some acquisitions on behalf of City Council and also due to some individual's donations to the museum. The Spanish Civil War (1936-1939) represented an important distress for the area of Art Heritage. The Catalan Government of la Generalitat de Catalunya designated Saint Ignatius' Cave as a deposit for protecting movable assets and guarded it by the forces of order. The brave and risky actions of some people protected and saved many artistic goods in that agitated period of time. In 1941 the Municipal Museum was reopened on a new location: The Saint Ignatius' Old School. The Museum and its collections had suffered important changes, resulting from the damages caused by the Spanish Civil War. Thus the museum batches grew thanks to the addition of some artistic and patrimonial objects rescued from the war. Most part of those objects belonged to destroyed churches and others were recovered by two Hiking Clubs, the Centre Excursionista de la Comarca del Bages, founded in 1905, and the Centre Excursionista Montserrat, founded in 1923. The Museu Comarcal de Manresa, was opened with a renewed presentation of its collections in 1977, after having been closed for some years. It offers services at a regional level and shows multidisciplinary collections, focused on art and history of Manresa, Bages region and Catalonia. 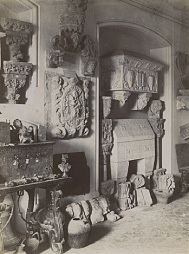 Museum room at the Saint Ignatius' Old School, in 1950. Since its inauguration at the end of the 19th C., the Manresa City Council has run and managed this institution. The MCM is located at the Saint Ignatius' Old School, a big quadrangular building with a great central neoclassical cloister, which stands near to the Baroque construction of Saint Ignatius Cave and the Gothic church of Santa Maria de la Seu. The old Saint Ignatius' School was founded on 1625 thanks to private donations and also to Town Council, which transferred Saint Lucia's Hospital to the Jesuits. 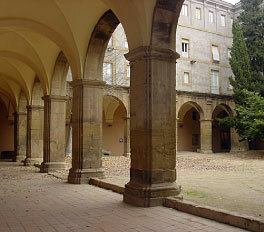 So, this building then became the second Jesuit boarding school of Catalonia, just after the Betlem School in Barcelona. The school, that was enlarged in 1750 and renewed in 19th century, with a central squared patio with a cloister, connects to every wing of the building. The Society of Jesus directed the school until 1892. Since then, the Town Hall has been in charge of it. In 1901, the building became the School of Arts and Crafts seat and along the 20th century, the building has been used as military barracks, laboratory and library. The MCM was installed in the first and second floor of the school in 1941, along with the Historical Archive, that was installed in the basement and also on the first floor. Later, in 2002, the ground floor became the seat of the Manresa Tourist Office.